Sudarshan Chemical as the name suggests is a Chemical Company. As per company website it is active in over 85 countries. That means products of this company is exported to countries outside India. It has sales offices in countries like Netherlands, USA, and China. The company has two production sites. Both of them are situated in Maharastra. One of the sites is in Mahad and other is in Roha. Below is list of product and their commercial application. It would give you brief idea about Company operations. It is the largest pigment producer in India. Pigments are used in various industries like Coatings , Plastics , Inks and Cosmetics. Pigments are mainly used to give color to products of these Industries. For example Inks have wide range of colors. Pigments are responsible for these colors. Thus Sudarshan Chemical have industries as consumer of its end products. So development in these industries will act as a growth driver for the company. If demand from these industries are less than that will have negative impact on the company. Now lets see how the company has performed on stock exchanges. We will see the price movement from IPO days. As per Dow theory price movement includes everything a company goes through. 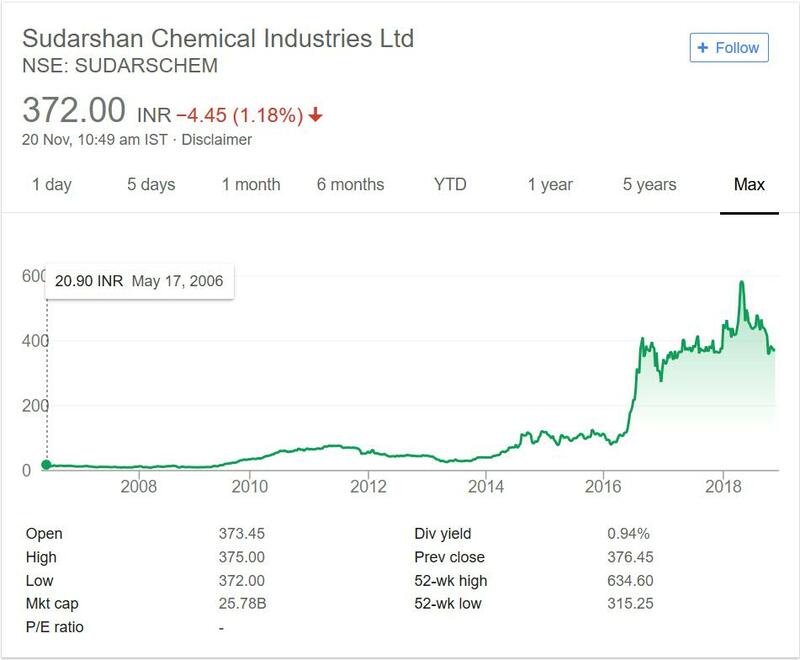 Below image shows price performance of Sudarshan Chemicals over the years. The company made its debut on exchanges in year 2006 at 20 odd levels. After sometime the prices were impacted by 2008 global crisis. It took sometime for the Company but it recovered. After a brief positive period between years 2010 to 2012 again the company had slow downtrend for 1 year or so. From year 2014 the company due to overall bullishness performed better. But it was in year 2016 Company jumped significantly and crossed 400 mark. Recent 2 to 3 years were positive for the company. It was the reason company went past 600 mark from 100 to 150 mark. SO four fold jump in prices only in recent time. The stock also pays healthy dividend of close to 1% at current market price. Sudarshan Chemicals is in portfolio of Vijay Kedia one of the top investors in India.Broadly Company is in Chemicals Sector. But in recent times due to advanced in Science and Technology Chemicals sector has become very broad. You will find many unrelated business clubbed together in Chemicals sector. The company operates in Pigments area. There are not too many players in this area. Pigments is industry dependent business. The demand of colors in other industry is the main driver. Sudarshan Chemicals have benefit of being largest Indian player and old player in this area. So there will be client base of it. The challenge is to maintain the client base and grow it. Note demand of pigments in these industries will continue to have steady growth. Personally I am not big fan of pigments sector. The reason is simple. Being industry oriented company the scope of growth is somewhat limited. If the client faces any growth issue then company will face the heat. It will have to search for other Client. Sudharshan Chemical or for that matter any other pigment company should focus on increasing client number , decreasing dependency on a single client. It is one area you should look into before making any decision about this company or any Industry centric company. I have added Sudharshan Chemicals in my stock watch list. This way I can track the company and get more details about it. You can also do the same. In next article I will cover one more interesting company in which one of the top investors has put his money in.